Ladakh is renowned for its remote mountain beauty and culture. It spans the great Himalayan, Karakuram mountain ranges, zanskar ranges and the upper Indus valley. The surrounded beautiful snow peak and multi- colored mountain are seems to be artificial or unbelievable its own fances. Often branded as the land of numerous passes, mystic lamas, broken moonland and the last Shangri la,Ladakh beckons tourists to discover its mountains,gorges,winding rivers, glacial slopes and shimmering lakes. The wilderness here, have its own charm and mysticism.Its has its own culture so, way of life spent,way of marriage,cultivation , kinds of foods etc are totally different from any parts of the entire universe. Zanskar Valley lies to the south-west of leh, surrounded by the Himalayan and Zanskar ranges, which is the most, isolated all trans-Himalayan valleys. It takes two days, with a night stay at Kargil, to reach Zanskar one needs to face the rough road beginning from Kargil. The mountains and landscapes are greener and vegetation then Leh range with her flora and fauna attract people all over the world. 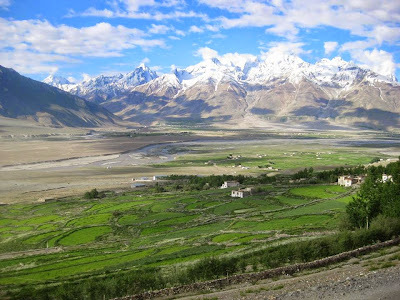 zanskar has numerous trekking route then other part of ladakh. Which are remains unknown to many trekking organization. Zanskar has two river which follow from valleys of Stod (Doda chu) and Lungnak (tsarab chu), which coverage below at Padum. The valleys has an area of about 5,00 square kilometers and an elevation of 13,154 ft. the temperature in summer is favorable for having leisure, tour and trekking. The temperature max 20% and min 15% in summer. The area remains inaccessible for nearly 7 months in the year. In winter the temperatures getting down to minus 20%. All the high passes get closed in winters. The only alternate route out of Zanskar in winter is the frozen Zanskar river, which has became popular destiny for winter tourist hikers. It is nearly week long walk on frozen river from zanskar to reach Leh. This is popular Chadar trek. The geographical isolation of Zanskar has resulted in the preservation of the Buddhist heritage and identity. Islam did not reach beyond Parkachik. The settlement of a small Muslim community in Padum area in the centre of Zanskar,is rather a recent phenomenon. Many ancient monastic establishments are still actively involved in religious activities. Some remote caves here are believed to have been used by the succession of Buddhist saints to sustain meditation pursuit of knowledge and enlightenment. The most sacred Sani monastery has a stupa of Kanishka period of 2nd century. IS A LEH-BASED RESPONSIBLE TOUR OPERATOR AND INCOMING TRAVEL AGENCY. WE SPECIALIZE IN CULTURAL, ADVENTURE AND NATURE TRAVEL WITH PRIVATE SERVICES. OUR PACKAGES AND TAILORED ITINERARIES RANGE FROM THE FAMOUS LADAKH TRAIL TO ECO TOURS IN THE HYMALAYAN RANGE, AND INCLUDE TOURS OF DEEPLY PLACE DESTINATIONS AND ALTERNATIVE TREKS TO ZANSKAR. An unmatched personalized service: we are highly-trained and knowledgeable travel industry professionals and our task is to make YOUR dream holiday come true. A unique experience designed to exceed your expectations: our expert guides will ensure that you enjoy an unforgettable experience. Extremely competitive prices offering the best price-quality ratio on the market: our aim is to provide you with an excellent quality of service at an affordable price, because at LIFE on the PLANET customer satisfaction is our priority. 24-hour support: We are based in Leh, exactly where you need us to guarantee the personalized care and attention you deserve during your travels through the Hymalayan Ladakh region. The best of both worlds: an authentic local experience with all the comforts of home. We invite you to discover for yourself the wonders of Ladakh. Travel secure in the knowledge that you are traveling with LIFE on the PLANET Ladakh! Lotus Choszang was born in Zanskar. His experience of trekking guide is 11 years. He is specialist trekking guide in Ladakh. Especially Zanskar trek. He can guide when winter Zanskar. He is also cultural official guide(He can guide to the monastery etc). He is kind and honest. Junichiro Honjo is a Japanese coordinator who has an experience of some coordination for foreign tourists. He has also stayed in Ladakh more than 8 years. Please let him know, if you have any questions.